Ellen Churchill Semple was born in Louisville, Kentucky on January 8, 1863 to an affluent family in the hardware business. She graduated from Vassar College in 1882 at the age of nineteen, valedictorian and the youngest in her class with a degree in history. She also had the honor of giving the commencement address. She returned to Louisville and taught with her sister at a private school, but ultimately found direction on a trip to Europe with her mother in 1887 where she came across the work of Friedrich Ratzel, a renowned professor of ethnography and geography. She returned to the United States and hurried to complete her masters in geography by writing her thesis, Slavery: A Study in Sociology. 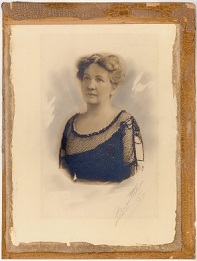 In 1891, she arrived in Germany to study at the Leipzig University under Ratzel, and remained there for a year despite the many restrictions against women seeking higher education. She returned again in 1895, but never received an advanced degree in geography because women were not allowed to matriculate in German universities, though they were permitted to attend lectures with special permission. Upon returning to the United States she published an article in 1901 in the Geographical Journal that gained her much popularity, entitled, "The Anglo-Saxons of the Kentucky Mountains, a study in Anthropogeography." She completed a year of field research, which was unheard of at the time, in the mountains of Eastern Kentucky, and delved further into the intellectual marriage between anthropology and geography. In 1903, she published her book American History and Its Geographic Conditions, which became required reading in geography classrooms across the country. In 1911, Semple took a trip to Asia and visited various countries, including India and Indonesia. She took many photographs in Indonesia and collected postcards from the other countries. She made copious notes of the experience and often used them in her later lectures and presentations. In 1904, she became one of the charter members of the Association of American Geographers and eventually rose to the presidency of that institution in 1921. She was awarded the Cullum Geographical Medal by the American Geographical Society of New York in 1914, in recognition of her distinguished contributions to the science of anthropogeography. In 1931, the Geographic Society of Chicago awarded her the Helen Culver Medal for distinguished leadership and eminent achievement in geography. Over the course of her career she taught at many academic institutions, including the University of Chicago and Oxford University, but did not receive a permanent academic appointment until 1921, when she was offered a position at Clark University in Massachusetts. In 1923, the University of Kentucky created a special room to house her private library and named it the Ellen Churchill Semple Room and also conferred upon her an honorary doctorate degree in law. To this day, the University of Kentucky Geography Department still hosts an Ellen Churchill Semple Day, complete with lectures and discussions. Semple died on May 8, 1932 and is buried at Cave Hill Cemetery in Louisville, Kentucky.